On Wednesday morning, January 17, 2018, troopers responded to Top Gun Firearms (gun store) for a commercial burglary. The establishment is located at 2800 South Belair Road, Fallston, MD 21047 (close to the intersection of Belair Road and Reckord Road). 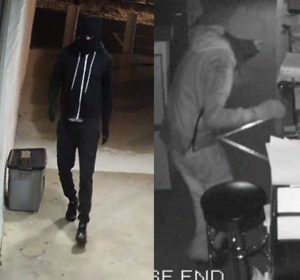 The suspect(s) entered the store and stole several items, including a 12ga pump action shotgun, and later exited through an undisclosed location of the building. The suspect(s) are described as a white males, thin builds wearing dark clothing, ski masks and dark shoes.